Long River (by A.P. Indy out of Round Pond, by Awesome Again), the last Grade 1-winning son of the legendary sire-of-sires to retire to stud, will be available at Anchor & Hope Farm in Maryland for the 2019 breeding season. As the last Grade 1-winning son of North America’s two-time leading stallion and noted sire-of-sires A.P. Indy to retire to stud, Long River is a major coup for Maryland breeders. A.P. Indy was the 1992 Horse of the Year when he won the G1 Breeders’ Cup Classic and G1 Belmont Stakes, and he topped the General Sire List in both 2003 and 2006. His best runners have included 2003 Horse of the Year Mineshaft, Champions and classic winners Bernardini and Rags to Riches, plus additional Grade 1 winners Aptitude, Girolamo, Golden Missile, Honor Code, Majestic Warrior, Music Note, Secret Status, Stephen Got Even, Sweet Symphony, Take Charge Indy, Tempera, Tomisue’s Delight, etc. In addition to their on-track exploits, A.P. Indy’s sons have long excelled in the breeding shed — even now, seven years after he was pensioned from stud duty, two of his sons and one of his grandsons can be found in the Top 10 Leading Sires of 2018, while sons of A.P. Indy currently sit atop the sire lists in both Maryland and Pennsylvania. Long River’s dam, the Awesome Again mare Round Pond, won the G1 Breeders’ Cup Distaff and G1 Acorn Stakes among her seven career victories, earning a total of $1,998,700 while campaigning for trainers John Servis and then Michael Matz, and owner Rick Porter’s Fox Hill Farm. Upon her retirement, she sold for $5,750,000 to Godolphin as a broodmare prospect. Long River was her first foal. The most interesting thing about Long River’s female family is that neither Mr. Prospector nor Northern Dancer will appear in the first five generations of Long River’s foals, making him a virtual outcross to those two omnipresent pedigree influences. This is even more noteworthy given that A.P. Indy’s most effective nick was with daughters of Mr. Prospector or his sons — A.P. Indy sired no fewer than six Grade 1 winners out of daughters of Mr. Prospector, with another six Grade 1 winners out of mares by Mr. Prospector-line stallions. Long River’s pedigree means that he is open for any and all avenues of accessing Mr. Prospector with no fear of excessive or too-close inbreeding. Although there are no daughters of Mr. Prospector himself left in production, there are plenty of mares by his sons out there to choose from who should work well with Long River. Longtime leading Maryland stallion Not For Love is the broodmare sire of at least five stakes winners by five different sons of A.P. Indy, while A.P. Indy’s grandson, Lucky Pulpit, sired two-time Horse of the Year California Chrome out of a daughter of Not For Love. Of the other sons of Mr. Prospector who have significant representation in the local broodmare population and should fit Long River, Two Punch is the broodmare sire of Grade 2 winner Keen Pauline by a son of A.P. Indy, and two other stakes winners sired by another of A.P. Indy’s sons (Two Punch’s son, Smoke Glacken, is also the broodmare sire of a stakes winner by a son of A.P. Indy); daughters of Allen’s Prospect have produced Grade 3 winner Palmilla and three other stakes winners by four of A.P. Indy’s sons; and former Pennsylvania stallion E Dubai is the broodmare sire of Grade 1 winner Effinex by an A.P. Indy son. Grandsons of Mr. Prospector have also been broodmare sires of at least 117 stakes winners by sons of A.P. Indy, including Petionville (by Seeking the Gold) who is now in Maryland and is the broodmare sire of four stakes winners by four different sons of A.P. Indy. The Maryland-conceived and -bred Eclipse Champion Declan’s Moon is by a son of A.P. Indy out of a mare by Norquestor, who is a son of Conquistador Cielo and is also the broodmare sire of another stakes winner by a different son of A.P. Indy. Former West Virginia stallion Black Tie Affair[IRE] (by Miswaki) is the broodmare sire of two stakes winners by two different sons of A.P. Indy, as is the one-time Maryland sire Press Card. Press Card is a son of the Mr. Prospector horse Fappiano, who has several other sons and grandsons that have had incredible success as broodmare sires when their daughters have been mated with sons of A.P. Indy, namely Quiet American (broodmare sire of fourteen stakes winners by sons of A.P. Indy; his male-line descendants include Real Quiet and that one’s son Midnight Lute, whose daughters should work well with Long River), Unbridled (broodmare sire of seven stakes winners by sons of A.P. Indy, including G1 Kentucky Derby winner Orb, plus there are nineteen more stakes winners by sons of A.P. Indy and out of mares sired by sons of Unbridled, among them Unbridled’s Song, Broken Vow, Empire Maker, Grindstone, and Eddington; former Maryland sire Domestic Dispute is from this line, as are Rockport Harbor, Old Fashioned, and leading West Virginia sire Fiber Sonde, daughters of any and all of whom would make sense with Long River), Rubiano (broodmare sire of five stakes winners by sons of A.P. Indy), and Cryptoclearance (broodmare sire of three stakes winners by sons of A.P. Indy; he is the grandsire of current leading sire Candy Ride, whose daughters and granddaughters should also fit Long River). Among the other sons of Mr. Prospector whose daughters have had success with sons of A.P. 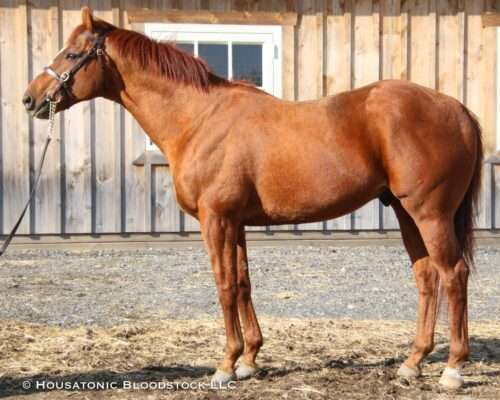 Indy are Carson City (broodmare sire of twelve stakes winners by sons of A.P. Indy, including five Grade 1 winners; local sons and grandsons of Carson City whose daughters could be tried with Long River include Hey Chub and Windsor Castle), Gone West (sire of five sons who are broodmare sires of stakes winners by sons of A.P. Indy, including Elusive Quality, whose daughters have produced a pair of stakes winners by two different sons of A.P. Indy; Elusive Quality is, in turn, the sire of one of Maryland’s current leading stallions in Great Notion, whose daughters should work well with Long River. The other stakes winners by sons of A.P. Indy out of granddaughters of Gone West include Grade 1 winner Malibu Prayer, out of a daughter of Grand Slam, who is also the sire of current West Virginia sire Limehouse); Smart Strike (broodmare sire of eight stakes winners, half of them Graded, by six different sons of A.P. Indy; and his sire sons Curlin, English Channel, and Lookin At Lucky will also have daughters that ought to work well with Long River); Forty Niner (who has at least eight sons whose daughters have produced no fewer than thirteen stakes winners sired by sons of A.P. Indy, including five by Distorted Humor), Thunder Gulch (broodmare sire of five stakes winners by sons of A.P. Indy), and Lemon Drop Kid (broodmare sire of four stakes winners by sons of A.P. Indy; he is also the sire of recently-deceased West Virginia stallion Charitable Man, whose daughters could be tried with Long River). Finally, Mr. Prospector’s son Machiavellian was the broodmare sire of a pair of Grade 1 winners by A.P. Indy himself, while his son Street Cry[IRE] is the broodmare sire of a stakes winner by a son of A.P. Indy, and a son of Street Cry[IRE] is also already the broodmare sire of a stakes winner by a son of A.P. Indy; Street Cry[IRE] is the sire of one of Maryland’s current leading stallions in Street Magician, whose daughters should match nicely with Long River. In addition to the Mr. Prospector sire-line, sons of A.P. Indy have also had considerable success over mares by sons and grandsons of Northern Dancer (and, as noted above, Long River will be a five generation outcross to that former Maryland stalwart, although he does have three lines of Northern Dancer further back in his pedigree). Among the branches of Northern Dancer that are most accomplished with A.P. Indy stallions is that of Storm Cat, whose sons are broodmare sires of at least 61 stakes winners bred on this pattern, including regional sires Cat Thief (broodmare sire of three stakes winners by three different A.P. Indy sons), Freud (broodmare sire of a pair of stakes winners by two different sons of A.P. Indy) and Lion Hearted (broodmare sire of two stakes winners by two different sons of A.P. Indy). Storm Cat’s son Giant’s Causeway is the broodmare sire of no fewer than seven stakes winners (four of them Graded, including Grade 1 winner Eden’s Moon) by six different sons of A.P. Indy; his son Fairbanks stood in Maryland until recently, and the latter’s daughters would be worth trying with Long River. Another Storm Cat stallion is Hennessy, the broodmare sire of a Grade 1 winner and another stakes winner by two different sons of A.P. Indy, while Hennessy’s son Wiseman’s Ferry, who stands in Pennsylvania, is already the broodmare sire of a Grade 1 winner by a son of A.P. Indy — the latter’s daughters should definitely be tried with with Long River. Another Northern Dancer line whose fillies have had success when mated with sons of A.P. Indy is that of Danzig. Danzig’s sons are the broodmare sires of at least 29 stakes winners from such matches, and those sons include former leading Maryland sire Polish Numbers (broodmare sire of two stakes winners by a son of A.P. Indy, and sire of the second dam of the aforementioned Horse of the Year, California Chrome), as well as current Maryland stallion Outflanker (already the broodmare sire of a stakes winner by a son of A.P. Indy). Pennsylvania is currently home to the Danzig son Rimrod and grandson Weigelia, whose daughters could make sense with Long River. There are a very limited number of runners thus far out of daughters of War Front (by Danzig), but given how strong the nick of War Front over A.P. Indy-line mares has been, the reverse cross should be tried as well, and there are numerous young War Front sons at stud who will have broodmare daughters eventually, like Mosler and Editorial in Maryland, plus Peace and Justice and Royal Artillery in Pennsylvania. The former longtime Maryland stallion Citidancer (by Northern Dancer’s son Dixieland Band) is the broodmare sire of a Grade 2 winner and another stakes winner by two different A.P. Indy sons, while Citidancer’s son Disco Rico is also the broodmare sire of a stakes winner by an A.P. Indy son; daughters of Citidancer’s Maryland-based son Cherokee’s Boy should work with Long River, too. The 1996 G1 Preakness Stakes winner Louis Quatorze (a grandson of Northern Dancer) is the broodmare sire of a Group 1 winner and another stakes winner by two different sons of A.P. Indy; he finished his breeding career in Maryland and his daughters ought to work with Long River. Medaglia d’Oro (by the Northern Dancer grandson El Prado[IRE]) is the broodmare sire of a Grade 1 winner by a son of A.P. Indy; he has numerous young sons now at stud, like Golden Lad in Maryland, and daughters of those horses will make sense for Long River, especially given how strong the reverse cross (Medaglia d’Oro over A.P. Indy) has also been. Although Long River’s dam is a daughter of Awesome Again (by the Northern Dancer grandson Deputy Minister), that cross was an extremely productive one, as there are eight Graded winners among the ten stakes winners by A.P. Indy out of Deputy Minister daughters. With five Grade 1 winners inbred to Deputy Minister within four generations, daughters of current Pennsylvania sire Medallist (by Deputy Minister’s son Touch Gold) are interesting here. Other broodmare sire-lines well-represented in the Mid-Atlantic with whom sons of A.P. Indy have crossed successfully include that of Blushing Groom[FR]. Five of Blushing Groom[FR]’s sons have produced the dams of a dozen stakes winners by sons of A.P. Indy, including Grade 2 winner Sara Louise out of a mare by Mt. Livermore, who is the sire of recently-pensioned Maryland sire Orientate (himself already the broodmare sire of a pair of Graded winners by an A.P. Indy grandson), and six stakes winners out of daughters of Rahy, who is the sire of former Mid-Atlantic stallion Bop. Kentucky Derby winner and former Maryland stallion Go For Gin (by His Majesty’s son Cormorant) is already the broodmare sire of two Graded winners by different sons of A.P. Indy, while Go For Gin’s brother Pleasant Tap (by another son of His Majesty in Pleasant Colony) is the broodmare sire of five stakes winners by A.P. Indy sons, so mares by both would make sense with Long River, as would those of Go For Gin’s regional sire son Albert the Great. The Roberto sire-line is represented these days by the likes of Dynaformer, Arch, and the latter’s son, Blame — Dynaformer’s daughters have produced eight stakes winners by seven different sons of A.P. Indy, while Arch is also the broodmare sire of a stakes winner by an A.P. Indy horse. Others from the Roberto line include Red Ransom, broodmare sire of nine stakes winners (including two Grade 1 winners) by seven different sons of A.P. Indy, while Kris S. (sire of Arch), has produced the dams of four stakes winners by three different A.P. Indy sons. More Than Ready (a grandson of Halo, who is, like Roberto, a son of Hail to Reason) is already the broodmare sire of five stakes winners (three Graded) by four different sons of A.P. Indy, and More Than Ready has several young sire sons whose daughters will also be worth trying with Long River. Finally, Honour and Glory (by Relaunch) is the broodmare sire of last year’s Eclipse Champion 3-year-old colt West Coast among his three stakes winners by three different sons of A.P. Indy. Another Relaunch son, Skywalker, is also the broodmare sire of a trio of stakes winners by A.P. Indy stallions, and while Relaunch’s most successful current representative, Tiznow, is not yet the broodmare sire of a stakes winner by an A.P. Indy son, the reverse cross has been very successful, and it seems only a matter of time before Tiznow mares click with A.P. Indy’s sons; among Tiznow’s sons at stud include Maryland’s Bullsbay, whose daughters should also fit Long River.